Parts: 18 pressure-cast resin, including base. Ugh Models! debut kit release was this "Shi-Tzu"-class Light Attack Craft in 1/350 scale. It's based on the craft that play a prominent part in later books of the Honor Harrington novels by David Weber. I saw this model at Wonderfest and, being a fan of the first half of the series ( alas, like The Expanse, I just can't get into the most recent books), I had to immediately pick up a copy. Inside the box are 18 pressure cast resin parts, a small strip of decals and two sheets of instructions/paint guide/"history". 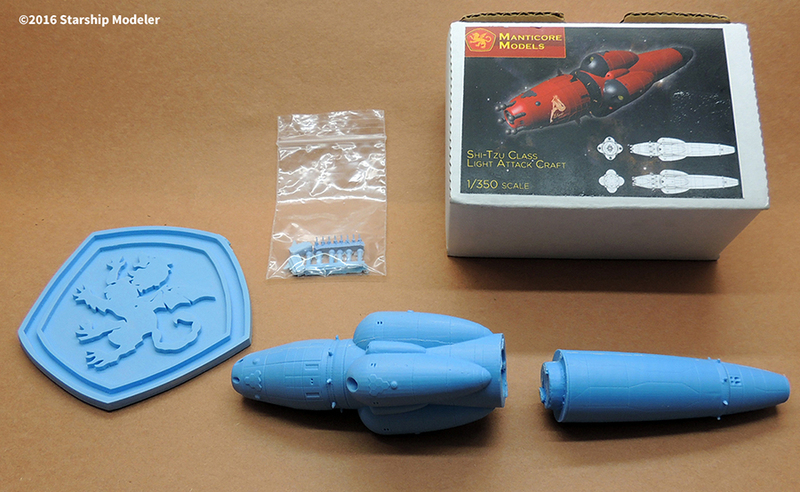 Resin parts include two halves of the main hull, four small blocks containing detail parts, and a display base featuring a rampant manticore. You will have to supply your own stand from brass or acrylic rod, or similar. 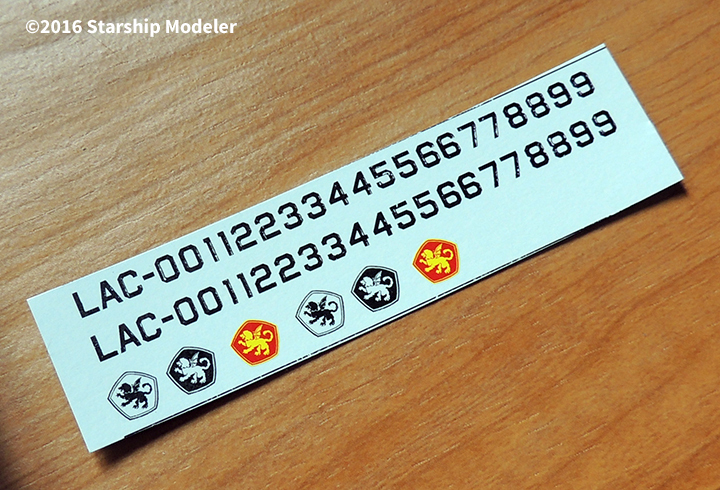 Decals consist of a small sheet of emblems and a "number jungle". They are ALPS-printed, and so will be thin and fragile. I recommend brushing a thin coat of Microscale's "Liquid Decal Film" over them before use. (You can get this stuff at any reasonably-stocked hobby shop, especially those that cater to model railroaders). Instructions are on one sheet of paper. 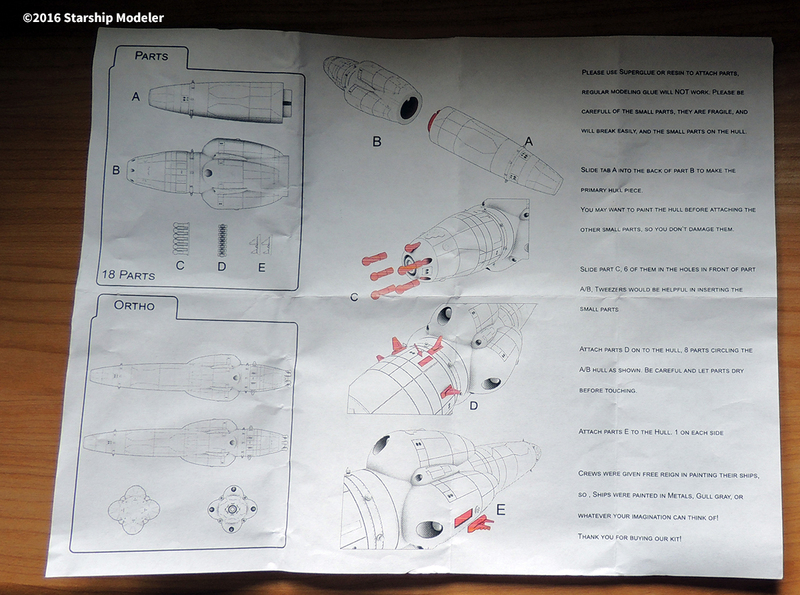 These consist of a parts diagram, 4 view drawing of the completed craft, and a step-by-step illustrated assembly guide. A second sheet provides a short "history" of the type (as used in the "Honorverse") and several color profiles of suggested paint schemes. Ugh! Models is a relatively new name in the garage kit industry, but the people behind the company have been casting professionally for years. It shows. 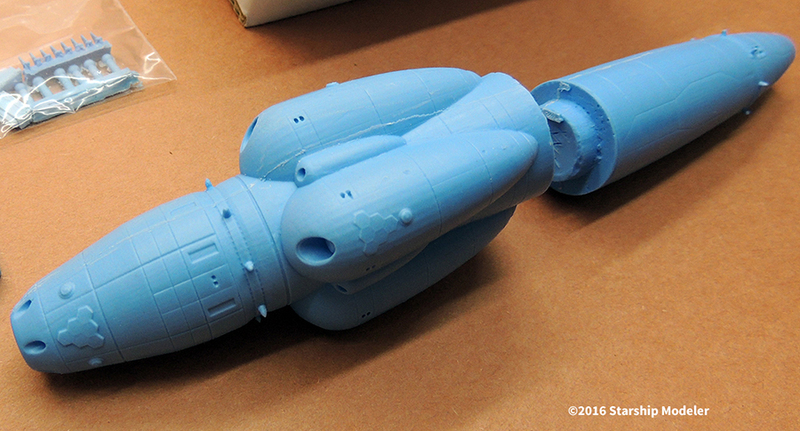 The resin parts are free of warping, bubbles, pits and other flaws. 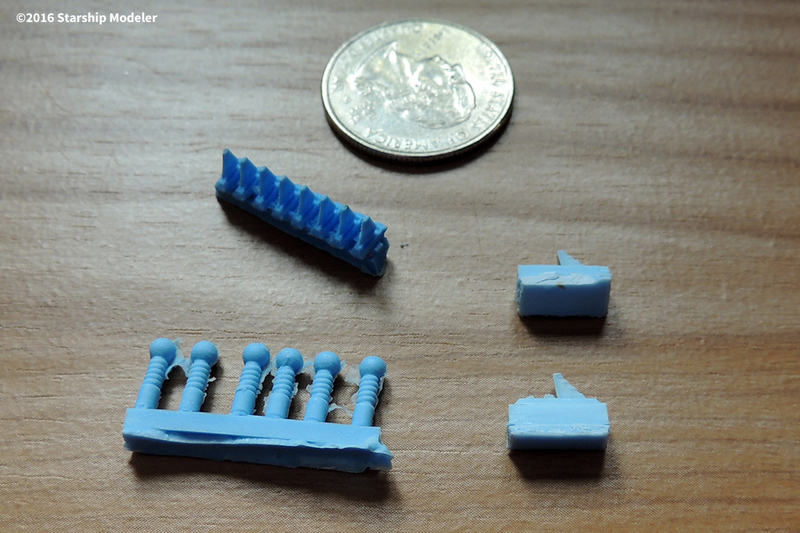 As you can see in the images below, there is only a tiny amount of flash along the mold seams to clean up. The master pattern was developed in CAD and then 3-D printed. This makes for some really sharp surface detail. You can also see the "ridges" characteristic of 3-D printed objects on the surface, especially on the main hull halves. While this should be fairly easy to sand smooth, I plan on leaving it alone. I think it gives a realistic surface texture in this scale. Real vehicles and vessels this size (approximately 220 feet/ 68m long) are never perfectly smooth - and if you've ever stood on a dock next to a large ship, you'll know what I'm talking about. Assembly should be very straightforward. There were small casting blocks I had to remove from the two hull halves where the parts join together. A few minutes with a razor saw, followed by some gentle sanding, and the parts fit together perfectly. The fit is tight enough that the join will not need any putty. This will make painting easier, as you can drill holes inside the pieces and mount the two halves on skewers or scrap plastic (like a lollipop). Once the paint has cured, remove these "handles" and glue the parts together. I'd suggest leaving the forward �.. lasers? Tesla coils? (the six parts #C) off until the very end, so you don't snap them off while handling the model. I'll probably leave them off completely, as I like the look of the vessel better without them. Ugh! Models' 1/350 "Shi-Tzu"-class Light Attack Craft is a nice-looking, well-engineered and well-made model kit of an interesting subject. If you've never built a resin model before, this would be a good kit to learn on - or, for the more experienced builders, a nice change of pace. I look forward to seeing more kits from these guys. Many thanks to my own wallet for providing the review samples. Manufacturers and retailers, interested in getting your wares reviewed and publicized on a site averaging 6000+ readers a day? Contact us! 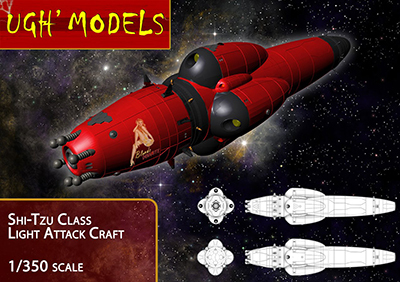 This page copyright © 2015 Starship Modeler. First posted on 5 February 2016.